Made with MS Paint 3D. CC BY 4.0. The music is a nice choice. I'm glad the colors weren't too vivid- I failed a lot and my eyes would been burning hot too. Save points = a necessity! 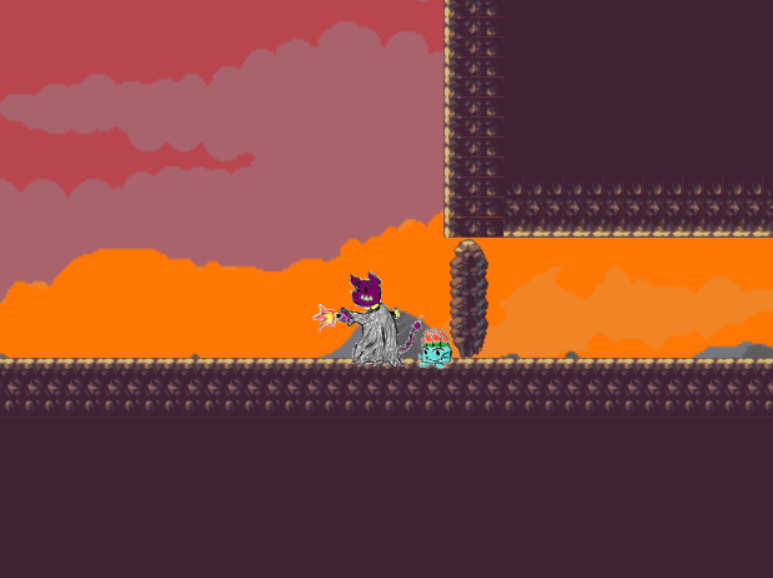 I liked that you could turn the enemies into ice blocks and they also melt away because it is very hot. I wasn't sure if I was hurting the demon guy at the end (I was thinking: was the strategy to freeze the fire and throw it back at him? etc.) So I got behind him and spammed the x button. That end though! There has to be a different ending! 😂 felt sorry for Snowdeth. Love the background! Trippy. Makes me want to eat healthier! I wish my FN keys were positioned easier so I could get in the zone and spam some keys. OHHHH I figured it out! I zoomed out of the screen and saw the commands that were at the bottom with keyboard controls. The powerup options are great! Made me think strategically for what hand position would work best for button mashing. I liked the black and white colors. Easy on the eyes at night when trying to repeatedly get a higher score! It is too fast for me to hit the notes. One suggestion: The instructions can be reorded according to what the player will experience. So "Songs can be selected with Enter." then "Song Selection can also be navigated with the arrow keys." Pleasing to the eyes! Lots of colors! I think it would have been cool to see the "tail" end of the trail as I circled the different rooms. I don't have a working team yet (holiday this week) but I'll definitely invite them to Discord when they're back! Yes I was able to go in! Thanks! Hm it says it is expired for me. There should be an infinity symbol (or something similar) to keep it active forever in the invite settings. Hello ArmyAnt Studios can please you make a discord server for this jam so we can communicate and plan games to submit? Please comment with browser name and version if you cannot see this game. Yes, as of 10/15/2017 this is all that is currently there. I love it! I should get back into Scratch. Suggestions: my friend couldn't figure out to press 'e'/'p' so making it extremely obvious would make it more playable (maybe a different color?). And for some reason I didn't understand that the elderly man was actually the wind (thought he was spitting out water) so I'm not sure if making that more obvious is necessary (could be just me). Overall greeaaat! Open Jam community · Replied to caramelcode in Unreal Engine HTML game? Open Jam community · Created a new topic Unreal Engine HTML game? Does anyone know how to successfully submit the HTML platform from Unreal engine? Still still under construction! Looking for a workaround! Open Jam community · Created a new topic Different countdowns? The countdown on itch.io and the one on CrowdForge are different; which one is accurate? I made an account on CrowdForge through Discord but I decided to make one through GitHub so I tried to start over and delete it. But, after I went through the process of submitting my email to get the link to delete it, the link sent me to an expired domain.